How did we come up with a list of the top ice-fishing destinations for the 2016-17 hardwater season? 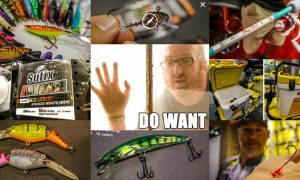 We reached out to hundreds of the top ice-fishing pros from across North America, used our own experience, and took TWI reader suggestions into consideration. Anytime you rank anything, folks get a little “passionate” (lol). So of course you might feel your favorite lake should be higher on the list, or just be on the list. Well, we’re doing this again next season so make sure you leave a comment – fire away! Lake Winnipeg has been made famous for its portly “greenback” walleyes that love to eat rattlebaits. Not only does the lake kick out high numbers of fish, but the average size is absolutely ridiculous. 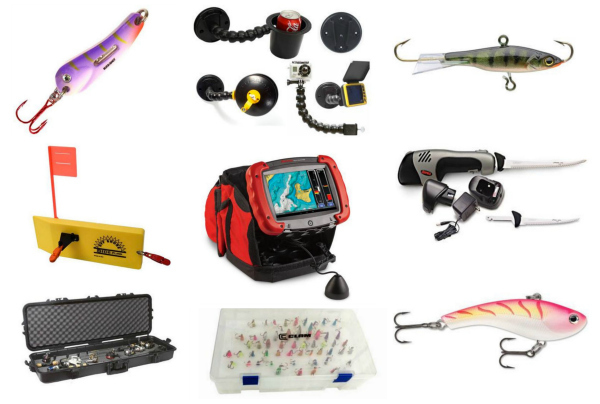 You have an excellent chance at catching a 10-lb (or better!) fish on each outing, and by the end of the day you’ll hardly bat an eye at a 24-26” fish. For that reason this lake should be at the top of every hardwater angler’s bucket list. The lake stretches 258 miles across, though most fishing takes place on the south shore at the mouth of the Red River – roughly 30 minutes north of the city of Winnipeg. The hard-packed snow makes “Big Windy” extremely tough on equipment, but the reward is worth the risk. The sheer amount of walleyes Lake of the Woods kicks out is almost beyond belief. 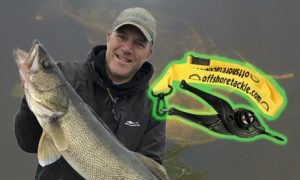 The south shore of the lake is known best for its expansive schools of eater-sized walleyes/saugers that bite all day long, but don’t be surprised if you ice a true wall-hanger there too. Though it’s popular, the lake fishes big – no need to worry about overcrowding and playing bumper shacks. 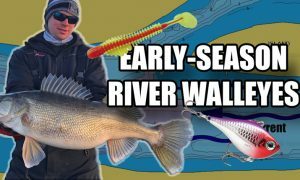 This border water offers an extended walleye season everyone should take advantage of. Lake of the Woods has also become a world-class pike-fishing destination during the March late-ice period. 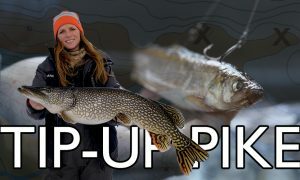 Mammoth pike will stage for the upcoming spawn in shallow bays, ready to pop tip-up flags. Believe it or not, 40-inchers are hardly considered “big ones” when the bite is on. The Ontario side has a huge population of slab crappies. Multiple fish pushing the 16″ mark are a real possibility. If you get on the right school, you could pluck hundreds of fish and the smallest may go about 13″…almost hard to imagine! As Jason Mitchell says, “the good days are as good as it gets” on the lake that just keeps growing. The toughest part is deciding which species you want to chase because there seems to be trophy-class everything. Devils Lake is a world famous perch fishery – with 15-16” jumbos being a real possibility – but you can’t overlook the outstanding walleye population with a year-round season. 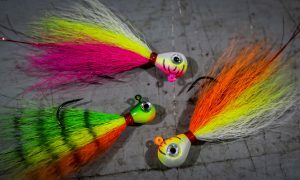 Leave the 6″ auger at home: Devils is packed with freshwater shrimp and the fish have serious girth. Lake Erie has one of the best balances of numbers and big fish in the world. 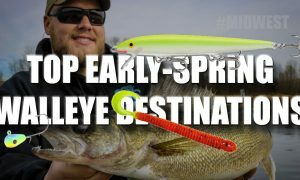 Millions of walleyes migrate back to the western basin in order to spawn after ice out – fish over 12 lbs are caught regularly when conditions are right and the lake is fishable. Erie doesn’t always freeze over, so you’ll need to take advantage of years where there’s good ice. Don’t be surprised if you see anglers scooting across the ice on airboats to maneuver over open-water patches and ice heaves. 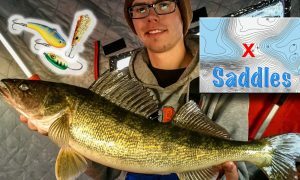 Double-digit walleyes can make an angler do some crazy things…. The northeast region of SD is home to hundreds of gravel-bottomed lakes, and the fish population strongly outnumbers people. The 2-lb jumbo perch put this region on the map, but there’s truly big everything waiting to be caught…in places such as Enemy Swim, Bitter, Waubay and Swan to name a few, but there seems to be a new slough (no one’s ever heard of) that emerges each season with the hottest bite and the biggest fish. You could spend years fishing little no-named potholes and hardly scratch the surface. Get familiar with this area. The Bay of Green Bay will keep you busy. 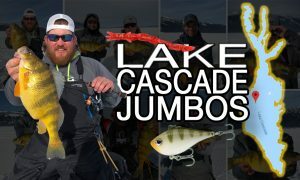 Though it’s best known for its number walleyes pushing 28-30″, the lake is also home to piles of whitefish that offer consistent action and a heck of a battle. Our recommendation: Target big walleyes during the low-light hours, then switch gears and nab your limit of whitefish during the day. The Milwaukee Harbor is home to the biggest brown trout and steelhead you’ll find anywhere. If you want an absolute battle, it’s the place to go. Several Chicago Harbors also offer excellent fishing opportunities when ice is good. Two-time North American Ice Fishing champion and USA Ice Team gold-medalist Tony Boshold says, “You don’t have to hop on a train and leave for Devils Lake…the perch train starts in Chicago!” Jumbos up to 15″ and 2 lbs are even more fun to catch when there’s skyscrapers in the background. Big and Little Bays De Noc are home to giant – GIANT – walleye. Need we say more? Upper Red Lake draws a crowd of avid ice-heads early because it’s usually one of the first lakes in the state to have fishable ice. In fact, most years ice fishermen are already driving snowmobiles and ATVs on URL while boats are still out in other areas of the state. Upper Red Lake can sometimes feel like you’re fishing on an off-limits rearing pond. When the bite is on, the fish will bite whatever you drop down as fast as you can drop it. Many nights you’ll actually have to pull in the rattle reels if you plan on getting more than 3 minutes of sleep at a time. 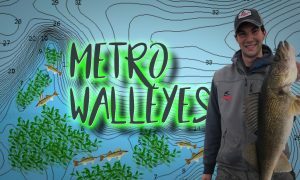 This walleye factory could likely be the best numbers lake for walleye across the ice belt, but the average size has been rising: Fish measuring in the low- to mid-20s are becoming much more common on day trips, which hasn’t always been the case. We’ve even seen several pics of fis measuring 28-30” from last season, so they’re out there. 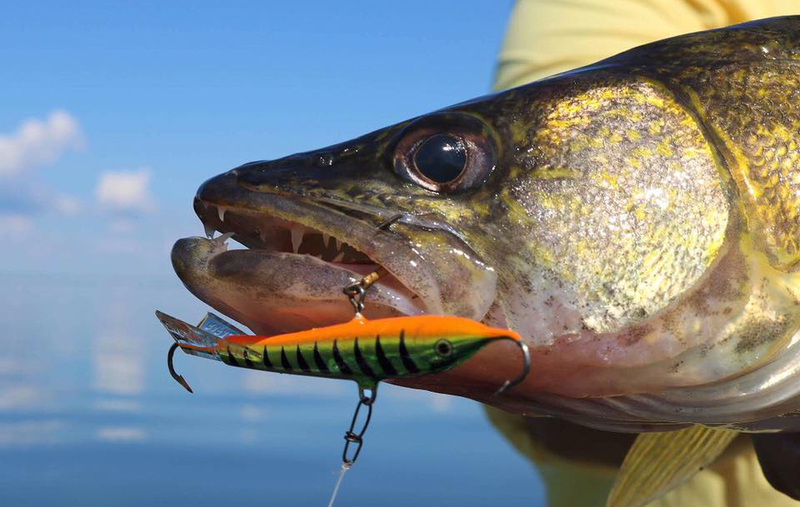 If you get sick of catching walleyes, you can switch things up and chase trophy pike. They’re caught every day even though they don’t receive much pressure. Gators in the 40-42” range love big sucker minnows soaked under a tip-up just a few feet below the ice. If you remember the crappie boom of the late ‘90s and early 2000s, there’s still a couple year classes out there to be caught. More and more anglers are sneaking out in March after the walleye season has closed and fishing for (and catching) those super-tall slabs. You’d be hard pressed to catch one UNDER 13 inches!! You may be able to catch more jumbos out in the Dakotas, but Gogebic will likely catch you the biggest perch of your life – fish up to 2.5 lbs are caught each winter. The perch grow so fat that locals call them “teeter pigs,” because you can set them on their stomach and they don’t teeter over. Finesse is the name of the game – don’t forget to bring the deadstick. This place isn’t for the faint of heart: It’s rugged, remote and kicks out big everything. 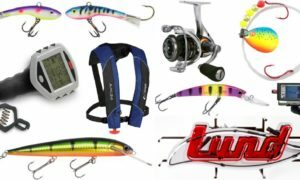 Anglers say one of their favorite parts about fishing here is that they’ll catch big walleye, northern pike and lake trout all out of the same hole, using the same baits. You may not see another angler for days, so hopefully you bring at least one buddy with you to take your picture…selfies aren’t easy when the fish’s half as long as you are. These are the “good ol’ days” on this multi-species paradise. It’s arguably one of the best walleye fisheries in the upper Midwest, but the jumbo perch fishing is on the rise. Stay out after dark and you’ll likely have the best fishing of your life…for eelpout. The average size and number of burbot in this lake is mind-blowing. People are finally realizing that burbs offer one of the most fun fishing opportunities there is through the ice, and Leech Lake is the place to be. Great place to come if you’re looking to break the provincial record – it’s been broken time and time again here. 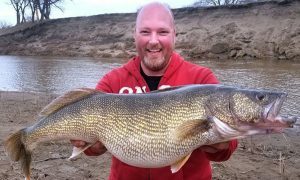 In fact, the current Freshwater Fishing Hall of Fame world ice-fishing record walleye was caught here in 2005 and weighed a ridiculous 18.3 lbs. You pike-fishing guys will be happy to know that it’s also home to pike over 25 lbs that have the potential to flirt with the 50″ mark – dang! The lake has tons of walleyes in it and they seem to bite all day and night. 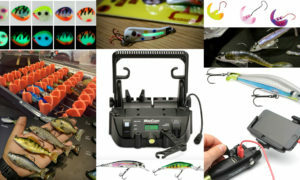 The best part is you never know when you’ll pluck a big 25- to 28-incher out of the school or run across some bonus jumbo perch, which are on the rise. Many world-class pike are caught each season, and the secret is now out that the lake’s crappies grow to gigantic sizes and can be specifically targeted in the southern bays. Just a small preview of what makes “the Big Pond”a must-fish body of water through the ice. 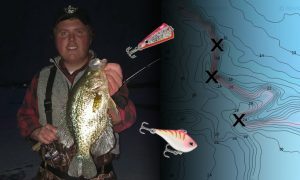 The hundreds of miles of backwater bays offer some of the most overlooked fishing opportunities anywhere for big panfish. It’s usually a shallow-water bite out of the current, and you’re lucky if you even see another angler. Tucked within the scenic Turtle River mountains in north central ND, Metigoshe consistently kicks out trophy-sized bluegills in the 10″ range. The deepest spot is just 24′ with an average depth of 11′ so they have plenty of room to grow. It took nearly a 1-lb average (16 fish ) over 2 days to win the last NAIFC event here, so…. Also known as “Long Lake,” this is one of the best drive-to walleye fisheries around, and is the place to be for early ice. 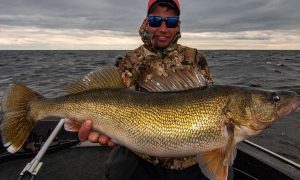 Eight- to 10-lb walleyes are good fish, but hardly picture-worthy here: BIG walleye up to 15 lbs are caught each year, and several 12-lbers are yanked out daily. Bay of Quinte is a long narrow bay on the north shore of Lake Ontario that’s home to monstrous walleyes – several fish over 14 lbs are iced each year. 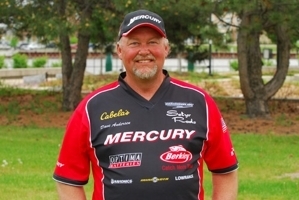 It receives little fishing pressure when compared to other trophy-walleye fisheries. Lots of good ice lakes – big and small – seem to get hidden in Devils Lake’s shadow. Lakes Irvine, Alice, Dry and Stump, and this duck pond or that flooded field – all are home to above-average-sized everything. Don’t be afraid to try the smaller no-named sloughs. You’ll strike out a few times, but it can pay off tremendously when you hit the right one. 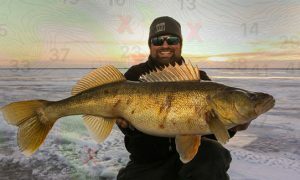 The number of quality walleyes you can catch in a single hour is worth the trip – LOTS of fish in the mid- to upper 20s. There’s also no shortage of 15” (or better) slab crappies roaming around, and if you catch one you’re likely onto a whole pile of ‘em. 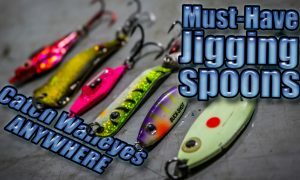 If you’re looking to catch a lot of walleyes, with some quality in there too, plan on visiting Saginaw Bay. Also think about taking advantage of the awesome fishing for other species too, like perch and lake trout. Ever wrestle a tank through the ice? Head here to have a shot at it. You’ll have the time of your life trying to fight and land double-digit lakers. 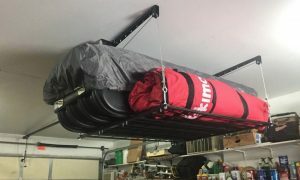 Just make sure you have the right gear….